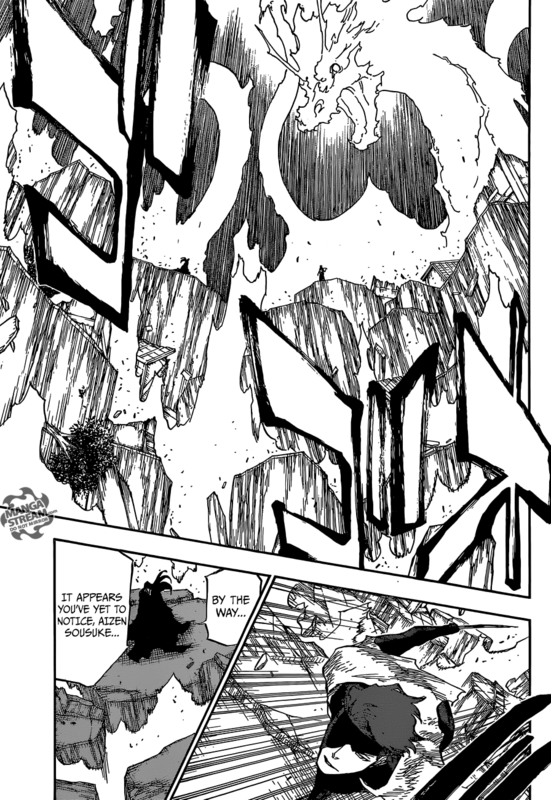 Yhwach destroys part of Sokyoku Hill, he questions why Ichigo didn’t have Orihime heal him. Renji attacks him and activates his Bankai, Sou Zabimaru. Yhwach quickly severs his arm and destroys his Bankai. 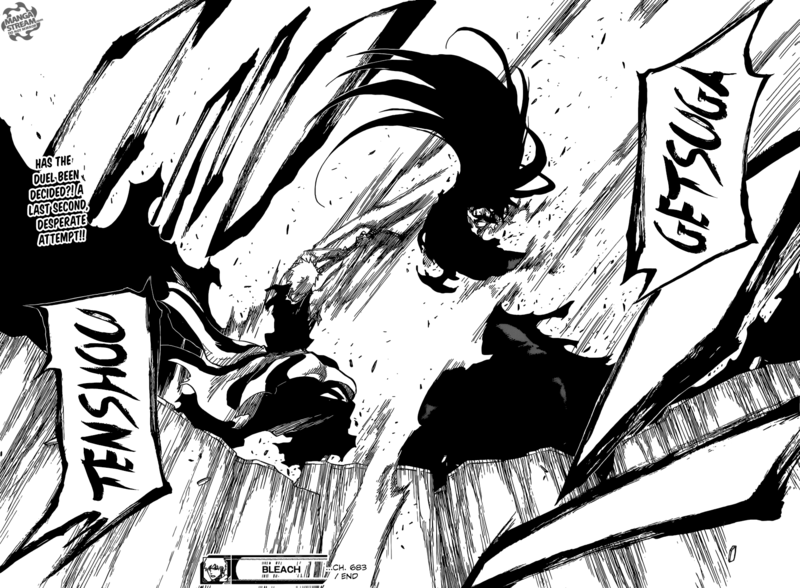 Aizen appears, attacking with Kyoka Suigetsu intervening. 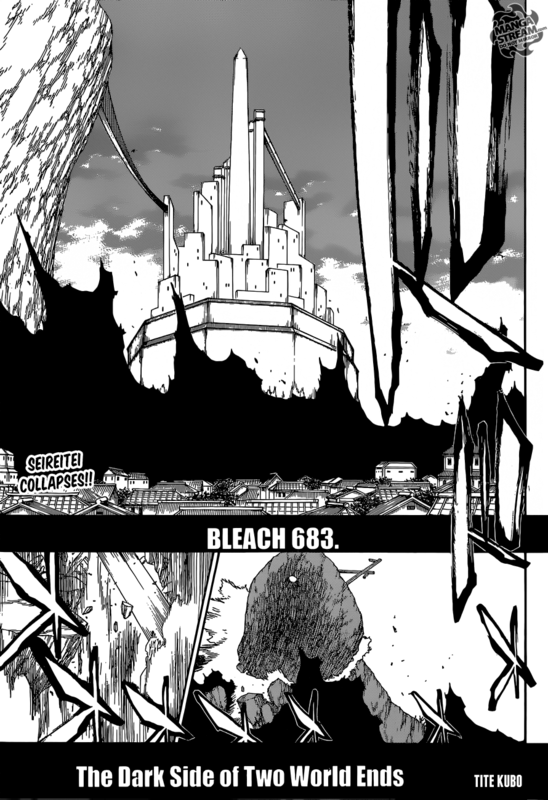 Yhwach teases him for fighting for the “losers.” Aizen uses Hado #99, Goryutenmetsu. A large dragon destroys the ground surrounding them, he them rushes forward. Yhwach points out that Aizen sword is cracked, then sends him flying backward with an energy blast. Ichigo appears behind him and Yhwach blows his arm off and single handily stops his Zanpakuto. He notes that even Aizen was ineffective. He shatters Tensa Zangetsu and blows a hole into Ichigo’s chest. However, it appear that this was an illusion and Aizen made it appear that he was Ichigo. Aizen is interested in this development, considering the fact that Yhwach was so certain that he wasn’t susceptible to the effects of Suigetsu. Ichigo impales Yhwach from behind and uses a powerful, Getsuga Tensho. This chapter was all about Aizen, fans have been anticipating an Aizen, Yhwach clash. 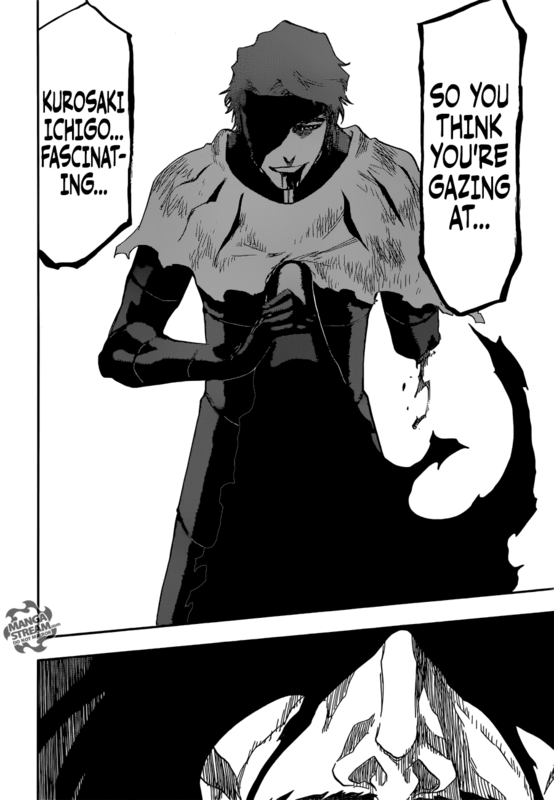 Unlike most of the Shinigami, I believed that Aizen would be a challenge for Yhwach. This fight is already more interesting than Ichigo initial fight with Yhwach. Class 1-A are excited about getting to create their own special moves. 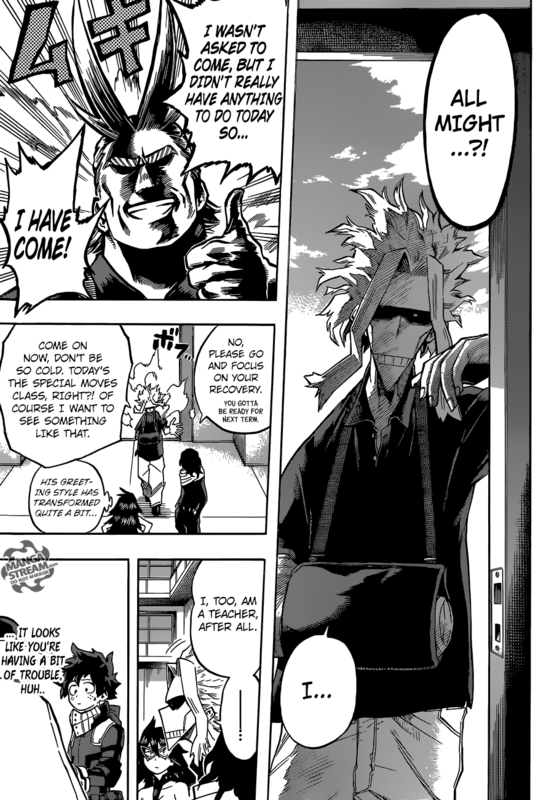 Cementoss explains that the Gamma Gym was created by him and he can use his Quirk to alter the gym to fit the needs of the students. Shouta explains the need for special moves. He explains that the “Hero License Exam,” is designed to test the “aptitudes” in “intel gathering, judgement, mobility, leadership and communication.” However, fighting ability is the most important. Midnight gives an example of a special move, like Kamui Woods, Lacquered Chains Prison. Shouta decides that during the summer break the students will spent developing there Quirks and special moves. He suggests that they update their costumes to accommodate their new abilities. Cementoss prepares the gym and Ectoplasm clones himself to spar against the students. 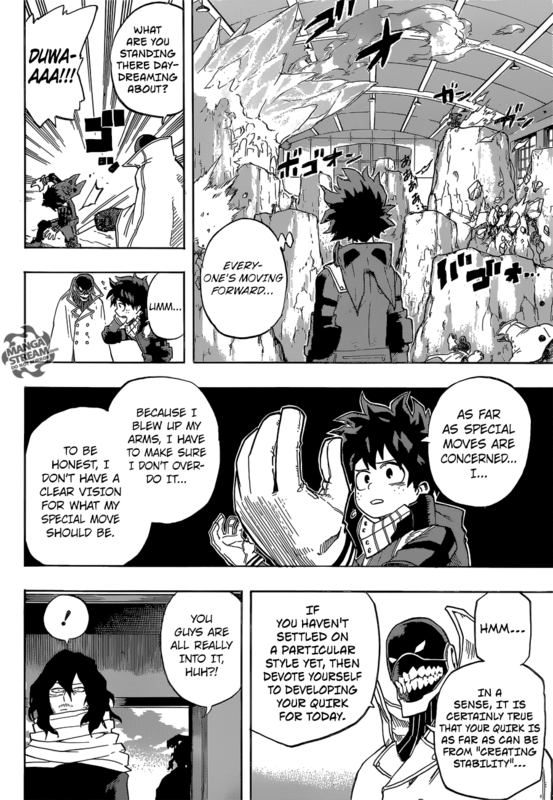 Izuku is confused, he’s unsure what his special ability should be. He decides that he will focus on his costume, instead of his special move. He thinks that he could upgrade his costume to protect his arms. Tenya and Ochako head to the development studio. Ochako wants to improve her ability to help her with her floating ability so that she could be more effective in hand to hand combat. Meanwhile, decided that she wants to minimize the effect of his, Recipro Burst. An explosion from the development studio sends Izuku flying. Mei Hatsume is responsible. She lands on top of him, surprising Izuku. I’ll be interested to see what special moves the students come up with. 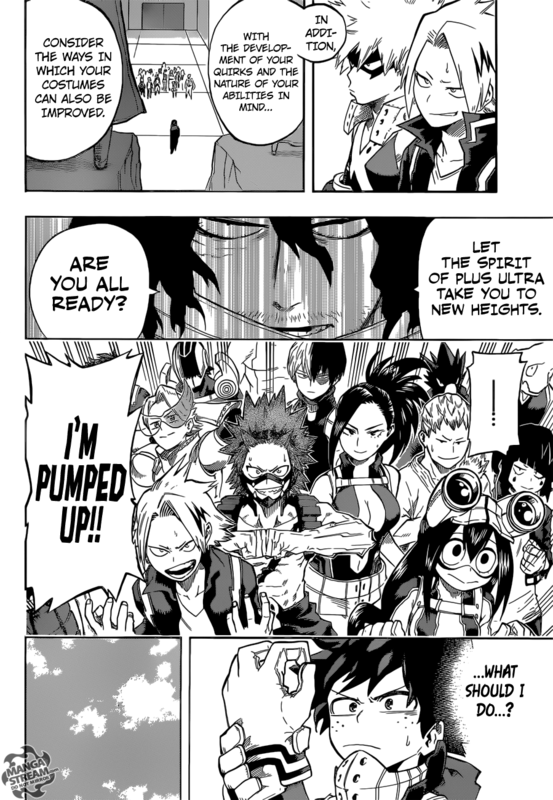 It appears that Izuku will always have difficulty with his Quirk. 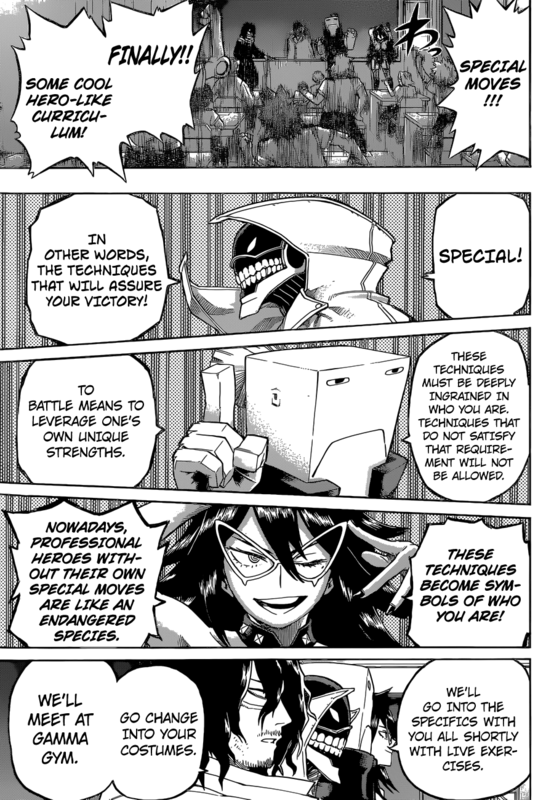 I still believe that Katsuki will become a bad guy or anti-hero eventually. I also happy to see new costumes because the old ones weren’t that good. In the Germa Kingdom, several Germa 66 agents are excited to see Sanji and Jajji fight. 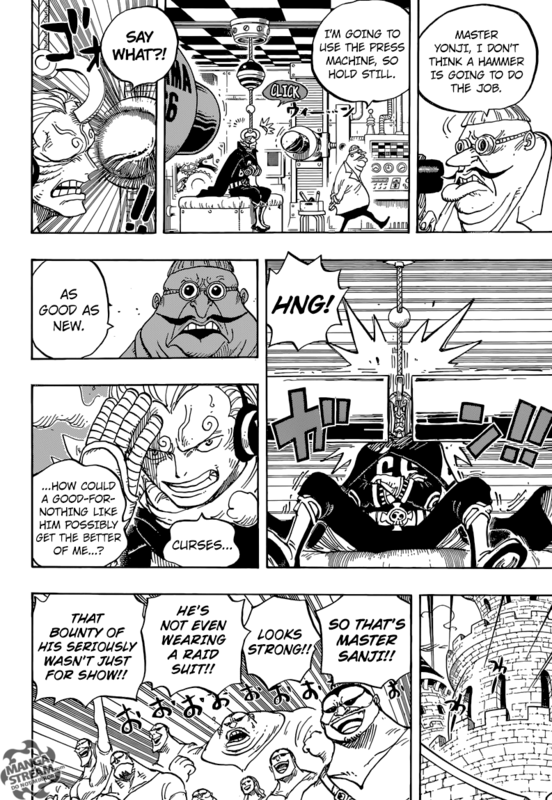 Yonji tells an engineer that he “told Sanji off and he attacked him leaving a dent in his head.”The engineer uses his “press machine,” to fix Yonji’s face. The Germa 66 agents are surprised by Sanji’s strength. 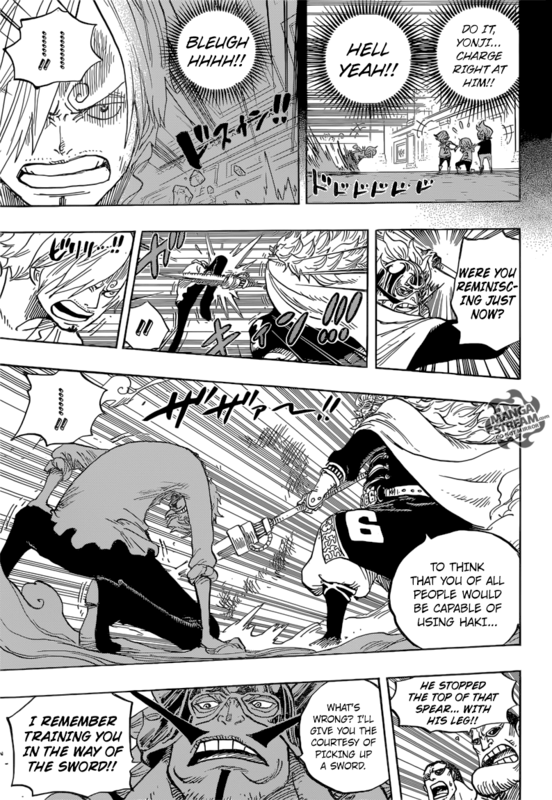 Sanji kicks at Jajji, who blocks the attack. Jajji uses his lightning spear to attack Sanji. He states that the only reason he return was to protect his crew. 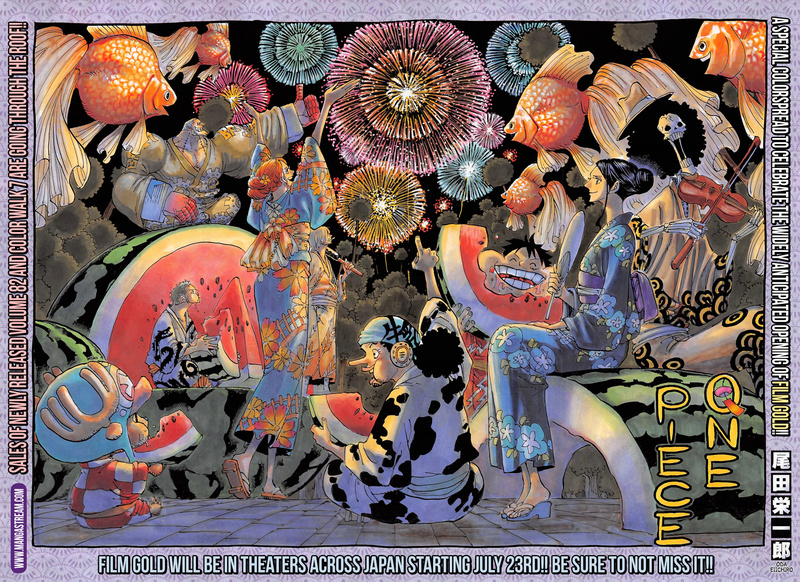 Jajji tells him that reneging on their pact with Big Mom, will cause her to seek vengeance. Sanji recalls his troubled childhood. He remembers the abuse he received at the hands of his brothers and his father indifference to it. In the present Jajji attacks Sanji with his spear. Sanji blocks it with his, Busoshoku Haki. This surprises Jajji and the Germa 66. Jajji leaps up and Sanji counters with Diable Jambe. Jajji blocks and grabs Sanji. He slams him to the ground and kicks Sanji with his electrified foot. He uses his shoe blaster against Sanji. Sanji uses Diable Jambe again, as Jajji commands his men to create a wall to block it. Sanji hesitates and Jajji takes advantage of the situation, piercing his agents body sending Sanji flying backward. Reiju aids Sanji, healing his wounds. Jajji tells him that the Germa 66 would give up their lives for him. Jajji explains that the alliance with Big Mom, is a guarantee of their conquest of the North Blue. He reveals that he doesn’t want to lose his most “precious sons,” and he rather sacrifice Sanji. While distracted, Sanji is trapped by Reiju. She places a “World Noble,” collar on his wrists to prevent him from escaping. This chapter of One Piece was well done. 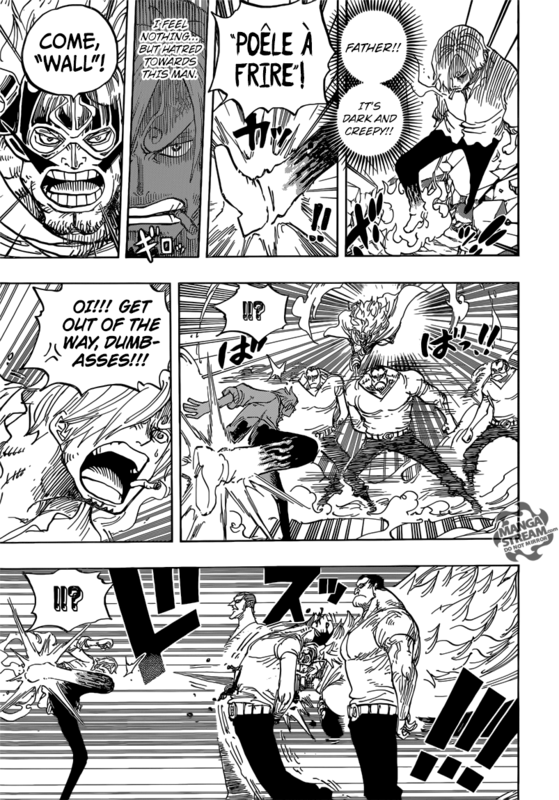 I was shocked to see that Sanji has learned Haki. His relationship with his family seemed obviously due to childhood abuse. I wonder if Sanji will sacrifice his hands for his freedom. I don’t think Luffy will allow it.